I hope everyone had a Merry Christmas, if you celebrate it, or a happy holiday season if you don’t. I returned to my mom and dad’s for our family get-together. It’s one of the few times of the year where all three of us daughters get a chance to visit together and with our parents, and we all look forward to it and generally have a really good time. I’m always happy to be returning back to my own house and bed and fur-family, but it’s still sad for the visit to be over. On Christmas day we had a couple of other visitors join us for a bit. The first one I noticed was the Boxelder Bug above. He was strolling along the windowsill, listening in on our conversation, though he didn’t have much to add to it. 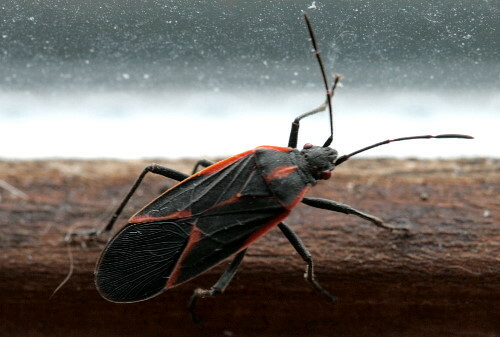 Boxelder Bugs, like ladybugs (such as the one below, who was the other visitor eavesdropping on our discussion), are common winter houseguests. They spend the winter as adults, and search for a cozy nook to hole up in over the cold months. This often ends up being cracks in your house’s exterior walls, and sometimes they can make their way all the way inside. Though I’ve seen the species before, this is the first time I’d actually spotted one indoors. In some areas they can be so common as to be a nuisance, but I’ve never seen such aggregations. The most I’ve personally observed in one place was at my sister’s new house this autumn, where she had a dozen or two crawling about her front porch. Fortunately, they’re pretty harmless. 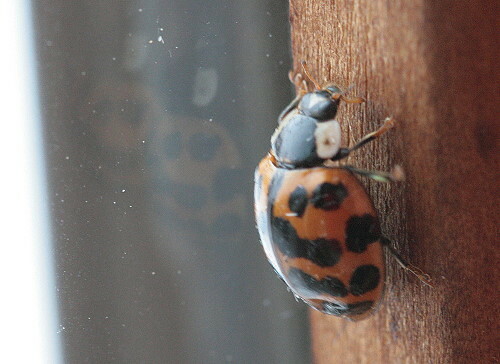 They don’t bite or sting, and unlike ladybugs, they won’t poop on and stain your window frames. Since it was much too cold to put him outside, we let him be. It was Christmas, after all. Boxelder bugs. I see them alot in Northern California, in the mountains where my boyfriend lives. Now they have a name, thanks! Generally I’m live-and-let-live with the insect world, but since I came home from vacation one year and found more than a hundred of these critters on the walls of my den, the “let live” part takes a lot more work for box elder bugs. On the other hand, they make wonderful cat toys. I love Lady Bugs and like Box Elder Bugs. Had many of them in Nebraska and some here in Portland, Oregon.